So what happens after Thanksgiving with all of that leftover turkey? Turkey pot pie, of course! Start by making the pie crust... Combine Flour, sugar and salt in a bowl. Cut butter into cubes, then add to the dry ingredients. Using your hands (or a mixer) blend together the ingredients - mixture will turn crumbly. Add the water and blend to form a dough. Divide dough into two balls. Heat the oil in a large saucepan over the stovetop. Add the chopped onions and cook until browned and translucent. Add the flour, salt, and pepper and stir. Add the chicken broth and milk to the saucepan and mix all the ingredients together. Lastly, add the peas, carrots, and turkey, and stir to combine. Roll out one of the dough balls into a square or circle depending on your baking dish of choice. Place the crust into the bottom of the dish. Pour the turkey mixture filling into the dish. Roll out the second dough ball to cover the top of the pie. Crimp together the bottom and top edges of the pie crust. Cut holes, slits, or a design into the top of the pie to vent while cooking. Bake in the oven for about 35 minutes or until the crust is golden brown. Remove and let cool. Happy Eating! 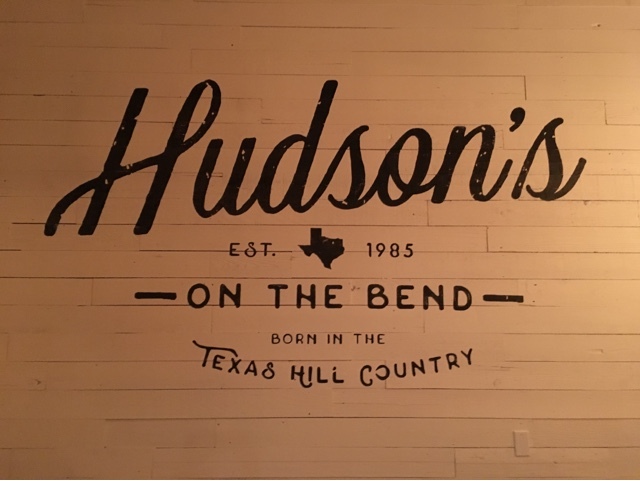 In a recent exchange of hands, Hudson's on the Bend has made a big come back! 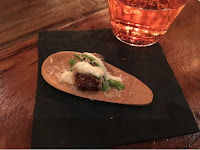 First up, I was greeted with a Venison Tartare served atop a sweet potato chip with fermented chili and black lime. 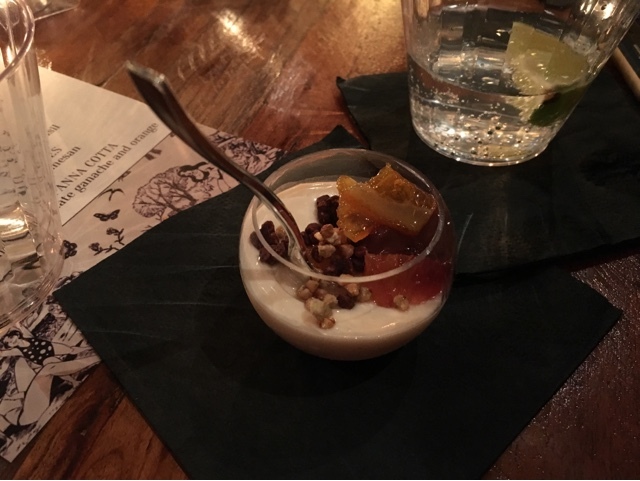 I've had my Tartares, but Venison?! It was truly Hudson's, and it was truly amazing. Or can you? Coming out of the kitchen next, hot from the fryer, was a perfectly salted buttermilk Fried Chicken. It was addictive, too addictive. And the accompanying tomato was just the right touch. In true Texas style, another tray carried around a Corn Tamale stuffed with smoked short rib and drizzled in salsa verde and crema. A wonderful bar-be-que Tex-Mex marriage.